happen to know if I buy a receiver would I be able to pick up english freesat programmes. the same one as used in Poland..
but is it the same one as used in Poland..
Unforunately, no. Not only are different satellites used, but the BBC channels are on Astra 2D, a so called 'narrow beam' satellite which only covers the UK and Ireland. < this shows you the size of dishes needed. sort out the installation..a friend of mine has offered me his old sky box (he's gone over to HD) so I suppose I could use his box (not with a subscription) and buy a dish. I take 200zl - 250zl max, commute up to 20km radius. In case of more difficult installation I don't increase the price or refuse. You're reading the wrong chart. 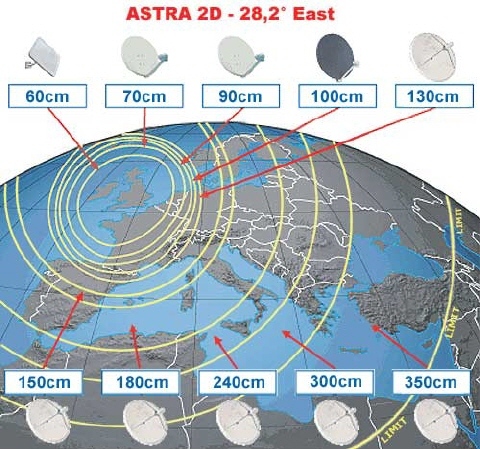 To pick up Astra 2D you will need a 240cm to 300cm dish (depending on where you are in Poland). Those cost a lot, as in 5,000zl for dish and installation, minimum. To pick up Astra 2B you will only need a 90cm dish. The problem is that all the free stuff is on Astra 2D. Getting the dish will be only the start of the trouble! Your choices are either to mess about with TV via internet or to limit yourself to Sky TV channels only (which is what I do). Are there ways of picking up the BBC iPlayer from Poland via the net? I know normally a non-UK IP address is blocked, but I believe there are ways of disguising your IP address ... Any tips on how? A VPN (virtual private network) does that. Some are free (findeable on google) but the free ones are unfortunately unreliable. There are various ways of watching British TV through the internet, but these tend to come and go. As soon as there's a good one, it tends to get spread across fora like this and the live streams are taken off the air. The more reliable programs tend to be privately operated by and for members. FilmOn works, but rips its streams from the user operated programs, so also can be patchy. I have a 2D receiver and a 88cm dish with a sky viewing card.This setup worked fine in Germany. The question is with out installing some mega dish can i still receive any British TV, we are now in Bielsko Biala. Can i pickup 2B channels with this setup and if so which ones? I pay £9 a month for a server in London which I can use to get BBC iPlayer. Works a treat :-). Does 4OD work as well? I've used "your freedom" for bbc iplayer of years, It works with all the UK players too. You are limited to a 60 minute connection each time but with bbc iplayer you just load the programme using yourfreedom and then just watch it without the proxy as Iplayer only detects that you are outside the UK as its loading. We use a slingbox with our TV at home - works like a charm and I watch it on my TV, not my computer, because I have a Sling Catcher. You get 200GB of bandwidth a month for the basic price. Does anyone have any good links for watching English TV at the moment? I believe there are ways of disguising your IP address ... Any tips on how? I use this. Had no problems with it. Get a 2m dish and you get everything free to air except BBC 3 and 4. BBC2 was available daytime only ... until a couple of days ago when mysteriously BBC2 Northern Ireland came in loud and clear 24 hours a day. Oh the joys of University Challenge - even got a few questions right :) Still miss Bamber Gascoigne though, with his wacky hair. And Chris Evans on Radio 2, as I munch on my morning toast and marmalade (home made). Oh smug, smug, smug! And to top it all, I even have home-made crumpets - excellent with Golden Syrup! With most programmes paid for, and probably nowhere near the amount of content as available on the UK version. You are right as it is rumoured to carry old content and not the current schedule of programmes that you see in the UK and apart from that there will be a fee to pay.